A while ago, I heard that there was supposed to be some sort of love triangle in the new series. At first, I expected it to be between Korra and the brothers. However, new info about a female character name Asami Sato has had me rethinking it. Bolin-Korra-Mako has the two brothers against each other for one girl idea. Korra-Mako-Asami AND Korra-Bolin-Asami has the typical two girls fighting for the same guy angle. So which angle would you expect in the series? If 'Other', then let us know what you're thinking. Oh no... a rumored triangle ... Oh yay a rumored triangle ... I am not sure how to feel. I don't recall any true triangles in the original series, so I am not quite sure how Mike and Bryan will take it ... I mean it still is a kids show. But to have more tension and strain because of a triangle, will make things interesting. Is Asami someone from Mako and Bolin's past? That could make it really interesting. If so who did she favor? Or could Asami be Mako and Bolin's mother? Oh man! I'd die if that were true. Of course then there goes the 'rumored' triangle theory. If Asami were involved, I would go for Korra-Mako-Asami, I kinda see Korra friend zoning Bolin at some point. But then again I can see the Bolin-Korra-Mako triangle working too ... although possibly not since I perceive Mako as being a bit edgy and if he is involved with Korra, I don't see Bolin trying because he doesn't want to upset his brother, or get in to a fight with him. (??) Or not ... I'm just rambling here. The whole Avatarfans talk about love triangles. That's interesting. So I think, there will be a triangle. Korra-Mako-Asami. I'm leaning towards Korra/Mako/Asami...with Asami possibly being an undercover Equalist using Mako to get to the Avatar. 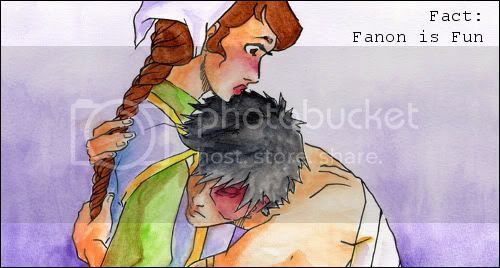 The love polygon is Bolin >> Korra >> Mako <<>> Asami. There's 2 that overlap and just make it complicated. "The reason that clichés become clichés is that they are the hammers and screwdrivers in the toolbox of communication." "Love is not a bandage to cover wounds." I initially wanted Bolin to stay out of it. I figured he'd get his own Yue/Suki down the line, and Korra and Bolin could be bros. Guess I was wrong. Oh well, shipping away! At the very beginning I was thinking that it was definitely going to be a Bolin-Korra-Mako, but now that Asami has come into the picture I am going to have to go with Korra-Mako-Asami. I mean when Mako showed up at the party with Asami on his arm Korra had a jealous rage for a second. I have a feeling the triangle is going to lean more towards Asami-Mako-Korra. I think that Bolin's thing for Korra was a quick little plug, and he seemed to bounce back though initially disappointed by her interest in his brother. I'm not sure if that holds any water, but I think that Bolin's feelings might get downplayed a little bit.